Mariann Virginia Donnelly, 63 of Roanoke Rapids, NC, passed away on Sunday, December 2, 2018 surrounded by her loving family. She was born in Wilmington, Delaware, to the late Robert Richman and Marian Plummer Wood. Mariann’s greatest love was her grandchildren. Mariann worked for the Roanoke Rapids Graded School District, something she loved so dearly, because of her love for children. She specially loved her Belmont family. Mariann is survived by her three daughters, Jennifer Neathery and significant other Courtney Floyd, Sarah Massey and husband, Jamie of Roanoke Rapids and Kelly Conner of Roanoke Rapids; her Grandchildren, Logan Neathery, Adalyn Floyd, Katie Floyd, Kenley Floyd, Camden and Ellington Massey; her brother, Robert Richman Wood, III and his wife, Linda; several nieces and nephews and her former husband, Wilburt Conner Jr. of Roanoke Rapids and her, sister-friend, Lynn Conner of Roanoke Rapids. Funeral Services will be held on Friday, December 7, 2018 at 11:00 A.M. in the chapel of Askew Funeral & Cremation Services in Roanoke Rapids, NC with Rev. Randy Martin officiating. 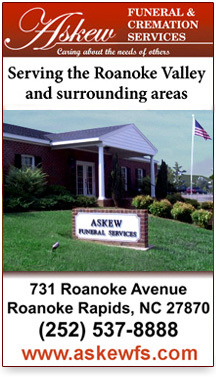 The family will have a interment service at Cedarwood Cemetery in Roanoke Rapids, NC. The family will receive friends on Thursday December 6, 2018 from 6:00 to 7:30 P.M. at Askew Funeral & Cremation Services in Roanoke Rapids, NC.